This page explains some key information, that may help you or a loved one/friend/patient who has been given a diagnosis of “cancer”, decide how to deal with the situation. A very linear, A to B to C, understanding (ie model) of “cancer” formation, that is based on 19th-20th century classical Physics models. As Niels Bohr (Nobel Prize Winner: Physics) pointed out 50 years ago, this model does not relate well to living systems – biology, disease process, etc. Bohr Niels. Atomic Theory and the Description of Nature. Cambridge University Press 1961, pp22-23. Here is a simple illustration representing the conventional, linear model of cancer formation and growth. In contrast, a completely different model to the linear one shown above, called, ‘general systems theory’, or just ‘systems theory’, applies much more closely to living systems, at every level of scale. Systems theory approaches are established, well-developed scientific concepts in many areas of study of living systems. However, this approach has not been applied very much to the problem of “cancer”. A basic feature of a complex system, like a small group of molecules, or a whole weather system, is that it has ’emergent properties’ – that are the outcomes of the many interactions that happen between the components of that system. These emergent properties are not ‘tied’ directly to any one of the many components of the system, and they can be very hard, or near impossible to predict. The expression, ‘greater than the sum of their parts’, is often used to explain ’emergent properties’ of a complex system. A common example of ’emergent properties’, are the completely unique patterns of snowflakes (figure 1). These patterns ’emerge’ from complex chemical and electromagnetic interactions. Now, to start to see how this example relates to “cancerous” growths, every unique snowflake can be thought of representing a completely unique occurrence of a “cancer” in an individual human being. It is well established, that regardless of where a “cancer” is found in the body, and from what kind of cells it arises – and so what “cancer” classification it receives at time of initial diagnosis – there are “striking” differences between one cancer and another even when classified exactly the same. 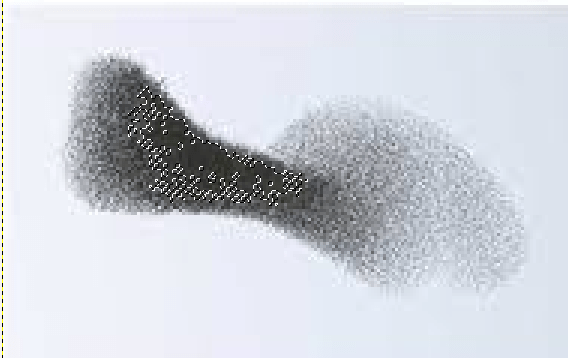 Another common example of ’emergent properties’, is the shape and overall movement formed by swarms of birds. A physical shape ’emergent property’ from millions of interactions. The darker, denser part is an especially focused area where the emergent property is ‘concentrated’. The analogy is that this concentrated area represents a place where a “cancer” could form in a particular area of the body, where the problem is most concentrated and cannot be normalized by the body’s normal physiology. These explanations might sound abstracted and a long way away from the hard reality of cancers, cancer cells, and cancer growth: but the very opposite is true. In the first two photos below, A & B, a brain tumor is shown, with ‘branches’ extending into the surrounding normal tissue. Photo B is a close-up of the branches (called ‘dendrites’). This kind of occurrence is usually termed “malignant” and “invasive”. These words suggest that the cancer cells are deliberately “bad” and are trying to “invade” and takeover the surrounding normal cells and tissue. But this is merely an out-of-date interpretation of what is happening, not a ‘fact’, as explained further below. Dendritic (tree-like) “invasive” branches of a brain tumor. In the next set of images below (A-D), using a systems theory approach, the researchers show the ’emergent properties’ (in this case, the shapes) of simulated growing tumors. What they did, was calculate the physical ’emergent properties’ of the simulated cancer cells in their ‘microenvironments’ (very small spaces) of the tumor, as a result of the complex interactions between the cancer cells, and between the cancer cells and the surrounding tissue. Notice how these calculations result in dendritic branches just as in the photos of an actual tumor seen above in the first set of photos! (A & B). What this shows, amongst many things, is that what we might think about a “cancer”, that seems to us “bad” and “invasive”, which are words that make it sound like the cancer cells are deliberately trying to be harmful to their ‘host’ (the human being or other animal with the cancer), are actually just the ’emergent properties’ of the problem microenvironments, that happen in unpredictable, complex ways – just like “bad” spots of complex weather patterns do just happen. There is no “bad” intention of the cancer cells. The other major understanding gained from this and other similar research, and more generally thinking about cancer using a systems theory approach (as explained above), is that normalizing the microenvironments of a tumor can very dramatically influence how a “cancer” spreads, changes or does not change, or even shrinks and disappears. Going even further, and extending exactly the same logic, the “cancer” itself, in turn, can then be understood, as arising in the first place because of the ’emergent properties’ of problematic (pathological) microenvironments. With these better and scientific understandings, logically, effective normalizing treatment for a “cancer” can then be developed by first examining its microenvironments in as much detail as possible, and then making every non-destructive intervention possible to directly and indirectly normalize and return to health those microenvironments so that the “cancer” will shrink and/or disappear. Read more. All images labelled A-D are taken from: Jiao Y1, Torquato S2 (2011) Emergent Behaviors from a Cellular Automaton Model for Invasive Tumor Growth in Heterogeneous Microenvironments. PLoS Comput Biol 7(12): e1002314. doi:10.1371/journal.pcbi.1002314. 1 Physical Science in Oncology Center, Princeton Institute for the Science and Technology of Materials; 2 Department of Chemistry and Physics, Princeton Center for Theoretical Science, Program in Applied and Computational Mathematics, Princeton University, Princeton, New Jersey, USA.